I have been visiting Nicaragua since 2005. It is a country with wonderful birds, coffee and lovely people. I was invited by Dave Davenport and John Connors, who had been co-leading some ecotours to Nicaragua since 2000. They had helped a group out of Durham (Sister Communities of Durham/San Ramon=SCDSR) to set up trails and cabins for a tourist operation at a restored shade-coffee farm, called Finca Esperanza Verde (FEV), near the town of San Ramon in Matagalpa province. I was asked to initiate some bird-banding and add to their bird-watching activities and I confess I was leery of going. But after just one visit, I was smitten. For the next 7 years we did 1-2 tours/year, during March, mostly with classes from North Carolina State University or Guilford College. In 2012 FEV was put up for sale. At that time, I had two new graduate students and decided to take them to another farm north of FEV to do some studies on Golden-winged and Wilson’s warblers – two species found to be fairly common in several coffee farms in northern Nicaragua. In 2013, FEV was sold to new owners but SCDRN remained active in supporting the local community and offering its own tours. Dave, John, and I have continued to bring tour groups down each year. We have helped to train Humberto and Omar, shown below, to be nature guides & excellent birdwatchers. Donations from recent trip participants and a generous discount from Tracy at the Wild Bird Center in Chapel Hill, paid for the purchase of 2 new pairs of Nikon binoculars. John Connors and John Gerwin flank Humberto and Omar. John Gerwin. and Dave Davenport give a (feeble) shout out to ecotourism. The Golden-winged Warbler (GWWA) is a species now quite threatened. Population numbers have declined dramatically in the past 20 years. As is often the case, we do not fully understand why – there are numerous factors involved. And like many (I suppose most) migrants, the Golden-wing spends 5-6 months in Central or South America. And so, to do effective conservation work, there is an International coalition of biologists who are working together to get, and share, as much data as we can about GWWA, across the species entire range (that is, breeding, migration, and non-breeding). My now-former student and I returned to FEV in 2014 to continue our studies of the GWWA. We have continued tagging individual warblers with color bands/rings, radio transmitters, and in 2015, geolocators. The radio transmitters allow us to track individual birds over very short distances/areas – the radio signal transmits about 500 meters from the bird to our receiver. With this technology we can find tagged birds and observe behaviors, e.g. how they feed, where they feed, who they are with, how much space they use, and more. In 2015 we were invited to participate in a multi-country effort to put a different type of tag on individuals of this species, that would track and record their migration. These are called geolocators. The units are solar-powered and last for up to one year. The units are attached using degradable thread tied in a figure-8 harness. They take many measurements each day to record the length of daylight, the date and time of day. These data can be used to estimate the location of the bird at the time of the recording because daylength varies by latitude and of course, changes as the seasons do. The units record the data – they do not transmit it – so the device must be recovered in order to download the data. To do that, we have to return to where we first caught the birds and try to recapture them. We have documented that 30-50% of the GWWA’s banded in one year will return to the same site the next, which makes this species a good candidate for the use of geolocator technology. The geolocator technology is not perfect. The accuracy of the point locations is good but not great (about 50 miles). But when a bird is migrating from say, Nicaragua to Pennsylvania, a 50 mile accuracy is good enough. If the solar panels can get covered by feathers, or debris; or if the bird spends a lot of time in denser vegetation, these can negatively affect the data collection. A male Golden-winged Warbler wearing a geolocator. In 2015 we deployed 5 geolocator units. In 2016, I received a small grant to return with more help, and more units. Our work at Finca Esperanza Verde is part of a multi-country effort in collaboration with scientists at Indiana University at Pennsylvania (Dr. Jeff Larkin); Cornell University (Ruth Bennett, Ph.D. candidate); the American Bird Conservancy; Audubon NC; and Jaguar Reserve & Ecolodge north of here. In addition, Jeff and Ruth are working with scientists in Panama, Costa Rica, and Honduras to deploy geolocators as well. In February of 2016, 4 of us went to FEV where we recaptured one of the birds from 2015 and deployed 18 more units on 17 GWWA and one Brewster’s Warbler (a hybrid between GWWA and Blue-winged Warbler). We also visited a coffee farm just north of FEV and put geolocators on 3 warblers. In November/December I sent two of my technicians back and they recovered 5 of the 18 at FEV – they did not have time to visit the other site. We received news that the unit from 2015 failed at some point in its life – the principle investigator of this project was unable to recover any data from the unit. This was disappointing news but is a typical event in the world if research – it’s always one flap forward and two flaps back. Jeff and Ruth are receiving units from the other countries. Hopefully a good number will provide data and by this summer, we will have generated a handful of migration maps, and we’ll know where the birds from each country went to breed. My two technicians also discovered more disappointing news. Many of the areas where we had captured the other birds that we had tagged in February, were occupied by new birds (unbanded). We don’t know if “our” tagged birds had gone to another area after being “asked” to carry this device around for a year, or if they had not yet arrived, or just what. The devices weigh 5% of the birds’ body weight – studies of birds carrying different weights have determined that 5-6% is the upper limit for an individual bird (so we don’t exceed 5%). But there could be other factors that affect a given bird, using this technique, that we don’t fully understand yet. So to be thorough, I came down in January, along with two Wake Audubon Young Naturalists, Olivia and Vanessa Merritt, to double check the FEV site, and visit that one other site to the north. Olivia and Vanessa are twin sisters who have worked with me for nearly 5 years, assisting with field and museum work. They are quite experienced at putting up the nets we use to capture birds, at tagging/measuring/releasing birds, and other field tasks as needed. They recently spent 10 weeks in Spain, where their grandmother lives. While there, they assisted with some migration/bird banding on Gibraltar island and during a 4-day period there were so many birds around that each of them removed ~250 birds from the nets – that’s a lot of birds in 4 days. So down we came, on January 3rd, to re-visit areas and assess the situation where the warblers hold territories. Another aspect of our study is to see if birds remain on territory during this non-breeding season. From similar work with Wood Thrush, we are finding that individuals seem to roam during the non-breeding season. And many do not return to the site where they were banded. I have banded many Wood Thrushes here at FEV but over the years, have not recaptured any. But in years past, a handful of our banded GWWA have returned and remained at least into March, so we’re trying to piece together this element of the species life history. My first two field techs banded ~20 male and 3 female GWWA’s in Nov/Dec, but reported that there are still unbanded Golden-wings on the property. So we will now try to capture/band as many of those as we can. Another element of our research is to band and monitor these birds for as many years as we can, to learn what we can about which ones return, and for how many years (some migrants we’ve banded in NC returned up to 10 years). So far this trip (in two weeks) we have not found any more of the birds from last year. We will continue to tag with bands (rings, really) any new birds we can capture. Vanessa and Olivia will also do some GPS (Global Positioning System) work to help create detailed digitized maps of the property (to outline the coffee plots, the forested plots, and other features on the landscape). We are also creating some educational documents that highlight the birds that visit the banana and hummingbird feeders. This farm has some nice cabins that can house up to 28 visitors and there are many tourists that visit between December and April of each year. So we are creating some educational material about both the resident and migratory birds that visit the feeders and are easily observed by the tourists. Coffee is an important product for many people – those who grow it, those who export it, those who roast it, and those of us who drink it. Small “traditional” farms grow their coffee plants in the shade of taller native trees and those trees provide habitat for many birds. Thus, there are two strong connections between a place like northern Nicaragua and North Carolina: the coffee we crave, and the migratory birds we love. And now we have a third connection: a number of these coffee farms provide lodging and guides who are here to showcase the plants and animals, and the coffee process, to anyone who wishes to visit. Birdwatchers/nature lovers are a welcome addition to the economy of this region. In subsequent posts, I will share a few adventures and discoveries during our time here. I will post images of some bird species that are local residents and which ar very much like some of our own residents, along with some familiar migrants. I will also describe the coffee-picking effort of Olivia and Vanessa and explain why they earned a whopping $0.25 (each) for their one hour of labor. So, make like our favorite local animal here, the sloth, and hang around. Photos by John Gerwin except first photo by Dave Davenport. Authored by John Gerwin, Research Curator, Ornithology, Museum of Natural Sciences; Treasurer, Wake Audubon. As many of you know, Wake Audubon has supported a youth group for about 6 years now (the Young Naturalists Club). The Museum of Natural Sciences has supported such groups for many years (e.g. Junior Curators). As part of my job as a bird researcher at a public institution, I get to work with these groups, helping to co-lead various activities. Over the past two years I have been working with a handful of kids from each group. They have been assisting with activities in the bird specimen preparation lab, the bird collections, and bird banding at Prairie Ridge. This year, I was able to offer them a “field camp” to one of my research study sites, to provide additional experiences. For this, we spent 5 days in mid-June in the Uwharrie National Forest, which is about 30 minutes southwest of Asheboro. The Uwharrie Mountains are the oldest known mountains and as such are well-worn. That makes them small by mountain standards – the highest peaks are only ~1000’ in elevation, with most of them topping out at 700-900 feet. But height is not the only factor – indeed, part of the camp was to see firsthand how the “aspect” of a mountain affects the habitat on that slope (the aspect is the direction the slope faces). And the see firsthand how steep some old mountains are! The bird I study primarily in this region is the Black-throated Green Warbler (BTNW), which is characterized as a bird of “northern” forests. This species is common in the higher Southern Appalachians, on up to Canada. Many such “boreal”, or northern, birds occur at the higher elevations because the habitats they seek are found on the north-facing slopes. BTNW’s in the Uwharries represent a disjunct population and are quite uncommon there. And there is yet another disjunct group in the Coastal Plain, from southeast Virginia to about Charleston, SC. I and colleagues are conducting habitat and genetic studies to understand more about this species across its range, and specifically, its behavior in the Uwharries region. One interesting thing I and my colleagues have documented over the past few years is that the BTNW occurs only on the north, northeast, and east slopes of Uwharrie mountains, but not on all mountains in that region. Use a compass, read a topo map, then head out with a map and compass to find, and survey for the warblers, on those NNE slopes. GPS may not always work, and batteries die so it’s important to know how to use a compass and a map for field work. Practice radio telemetry. I use this technique to learn about how the birds utilize the landscape. For that, we attach small radios on birds, which we can then find with a receiver and antenna. For this “field camp” exercise, I had access to a collar that had been used on some large mammals but was no longer being used. We were able to hide the collar in various places on a hillside and then allow each person to go find it. There is a bit of an art to this, especially when you are traipsing across a steep, often rocky hillside, strewn with fallen tree trunks and branches, along with patches of dense understory shrubs/saplings. The metal, rigid antenna is 2’ long with 3 tines on each side that are about 15”, and this is attached by a cable. All of this makes for some interesting “footwork” to get to where you want to go to find the beeping transmitter. Of course we hid the unit in challenging situations! Learn how to do a “vegetation plot”. This is one element of understanding how an animal uses an area, and why. We record a suite of characteristics about the places where we detect our marked birds. It takes about 45 min to do one plot and for a study, we will do 20-30 such plots for each bird tracked. Once again students could better understand how challenging this can be. Use our mist net/bird banding experience to capture and band some birds. Several unbanded warblers were found during the initial surveys; yay! We then went back to the two locations where these birds were found, set up mist nets, and used song playback along with a wooden model to lure any birds in. In the end, we captured and banded two one year old males. In the other location, the two birds would not come down low enough to be caught. They did respond to the playback, but remained higher than the nets (which only go up to 10’), and mostly sang back to the playback. I presume these were older birds who are typically more cautious especially at this time of year (they have finished their first breeding attempt and by the second round, older birds are typically less aggressive – the two younger males likely did not have mates). Walked a lot of steep slopes in the forest with food, gear, water, and fairly high temperatures (upper 80’s each day, even low 90’s on one or two). As one student pondered near the end of our 5 days…..”You guys do this for HOW many hours/day? And HOW many days each season?” It’s great to be outside, but the days are long and there are many challenges, which all were able to experience. We camped at a nice Forest Service campground. Nonetheless, some nights brought very noisy neighbors! This is another challenging element of field work. Fortunately, there is a gas station/market nearby, along the highway, that serves good ice cream! Somehow we managed to swing by that spot several times. We drove to the Carolina Raptor Center one morning to do a mist net demo for a group of 5th graders who were doing their own “summer camp” week with raptor center staff. In addition one of our newest Young Naturalists was able to join us there. She and her family were headed to Atlanta that day and were able to detour for most of it; a pleasant addition. We set up a couple nets, one near their feeder. We also deployed a couple of our wooden models, in order to show their kids how to use binoculars (which they had), with some positive reinforcement (models are much easier to find than a moving bird!). Just after lunch we caught a titmouse at the feeder, so their kids got to experience that as well. In the end, we had no rain the entire time, which was a pleasant surprise as mid-June usually brings some rain, at some point, in a 5-day period. We had a great time experiencing some elements of doing field work to study a bird species. In addition, we took time to enjoy other aspects of nature, such as the skinks and toads that abound, other species of birds, and the many plants around. We allocated time for journaling, reviewing photos, and just chatting around the picnic table. We probably stayed up too late a few nights, but a campfire has a way of causing one to stay up a little longer at night. Of course we did some S’mores one night – I tried out some vegan marshmallows, along with Rainforest Alliance chocolates, and organic graham crackers or flatbread (your choice). The marshmallows were pretty tasty, although I don’t think they toasted quite the same. I hope to do this again in 2015. Young Naturalists head out east! By Jeff Beane, Wake Audubon Vice-President. The Young Naturalists Club enjoyed a successful trip to the Albemarle Peninsula on Saturday, 22 January 2011. This trip featured the wildlife (focusing on birds and mammals), wildlife refuges, and wild lands of the Albemarle Peninsula, and included portions of Beaufort, Dare, Hyde, Tyrrell, and Washington counties. Trip leaders were Jeff Beane and Ed Corey; Miranda Wood also attended as a female chaperone. Club participants were Matt Burroughs, Matt Daw, Seth Gaffer, Jo Himes, Nate Laughner, and Kristen Shireman. 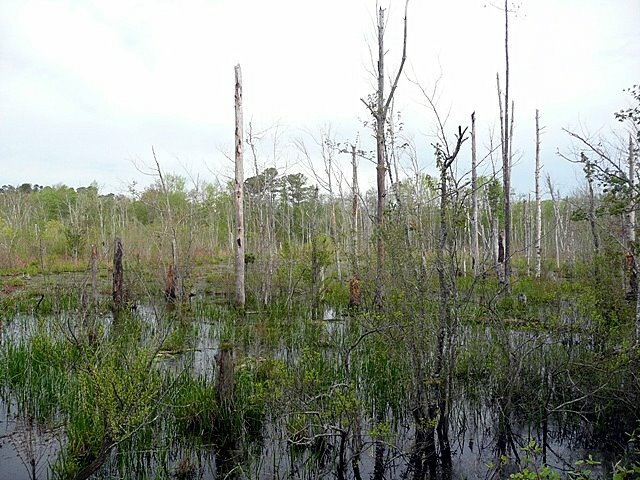 Our primary destinations were Alligator River National Wildlife Refuge and the Pungo Unit of Pocosin Lakes National Wildlife Refuge. We left Raleigh at just after 8:00 a.m. En route, we stopped at a couple of places along U.S. 64 to look at waterfowl, and were lucky enough to pick out a couple of Ross’s Geese from a mixed flock of mostly Canada Geese and Snow Geese near Plymouth. These were lifers for most of the group, though we were afforded only a fleeting look at them before a Bald Eagle flushed the flock. The day was cold, windy, and overcast, and temperatures did not make it above freezing all day. We had a snow shower at Alligator River, which became heavy enough at times to hinder our visibility, but we still saw a good variety of birds, most notable of which was a Swainson’s Hawk that passed directly above our heads. We were also able to approach two American Bitterns very closely. We were not, however, able to turn up any of the hoped-for Black Bears, Bobcats, or Red Wolves. We next headed for the Pungo Unit of Pocosin Lakes, where we had originally planned to spend a good bit of time. However, having heard several reports that the spectacular Snow Goose flocks of the previous weeks had not been seen recently, and that there had otherwise been little significant activity there, we stopped by that refuge for only an hour or so, during which time we saw very little other than the usual Tundra Swans and a few blackbird flocks. We added only a handful of new species to our bird list and again struck out on bears. Our last stop of the evening was a Beaufort County wetland mitigation site, where a good number of Short-eared Owls had been reported recently. Arriving about an hour before full dark, we were able to find shelter from the freezing wind behind a storage building; there we waited, keeping watch over a large, wet field where numerous Northern Harriers were foraging. At sunset we were rewarded with probably at least seven Short-eared Owls, and were able to get good looks at some of them. These also represented a lifer bird for most of the group. We capped off the day with a Pizza Inn buffet in Washington, and arrived back in Raleigh at about 9:10 p.m. We ended with at least 67 bird species, but it was a rather poor day for mammals. White-tailed Deer were the only live mammals that we confirmed; we also saw at least one Nutria, a Gray Fox or two, and several opossums and raccoons as road-kills. Despite the cold weather, a good time was had by all, and everyone learned something. Attention Young Naturalist’s and parents! On Saturday, January 8, the Young Naturalists’ Club will meet for a service event. The activity will involve trash cleanup at the Middle Creek Bottomlands II, a tract owned by the Triangle Land Conservancy along Smith Road in Johnston County. Much of the trash is along the side of Smith Road, but some is back in the woods or in the water. Trash bags will be provided. Bring warm clothes and work gloves. Waterproof boots and a garden hoe (for pulling trash out of water) are helpful if you have them. We may see some birds, too–this site is good for Swamp Sparrows in the winter. We’ll meet at the parking lot east of the Museum of Natural History and the state historical museum at 9:00 to carpool down to the site. If you’d prefer to drive directly to the site and need directions, they are as follows: Drive south from Raleigh on I-40 toward Benson and Wilmington. Well before you reach Benson, get off at Exit 319 (NC rt. 210) and turn left. Drive four miles and turn left onto Smith Road. There’s a sign at the corner that reads “Dodd’s Pro Body Works.” Drive down the hill to the bridge over Middle Creek, pass it, and drive to the subdivision on the far side of the swamp. Turn left onto Water Oak Drive and park there. Please let Erik know at erthomas (at) ncsu (dot) edu if you are going to attend! On October 18 the Wake Audubon Young Naturalist Club visited Bald Head Island for an afternoon of seining and walking the beach with Maureen DeWire, Director of the Bald Head Island Conservancy. The event was a lot of fun! Our day began with a 7am departure from Raleigh. We drove down and arrived just in time to miss our 10am Ferry from Southport to Bald Head. That ended up being for the best because we had some good birding from the marina: White Ibis, Pelicans, and Double Crested Cormorants. We caught the 11am ferry over and rode by tram to the Bald Head Island Conservancy Education Center. We had lunch in the classroom surrounded by neat touchable items such as skulls and shells that everyone got to check out. After lunch, we headed to the beach. Walking to the beach, there were clouds of butterflies on the Camphor Weed and Goldenrod including a Long-tailed Skipper, which pleased our Piedmont based group as it is uncommon here. Seining is where a long (in this case, 15 foot net) is slowly dragged through shallow water. We ran the seine three times, and found all sorts of neat things: juvenile Pompano and Kingfish, two varieties of crabs and a whelk egg case. While using our dip nets on the beach we found a sea star (which everyone got to let hold in their hand to see how the sea star’s many legs feel) an anemone, and a live cockle. After some time in one spot, we walked on the beach to the Southeastern corner of the island. We found a large dead horseshoe crab, a founder, and a freshly dead sting ray. The birding was fantastic, and between the bird watchers 60 species were seen. Some of the highlights include: Blackpoll Warbler, Lesser Black-backed Gulls, Western Willet, and three falcons: Kestrel, Merlin, and a very cooperative Peregrine Falcon that sat on the roof of a beach front home. The wind picked up and we made our way back to the classroom, and spent the rest of our time on the island looking for Monarch Butterflies to tag. Though prior to our walk there had been many around, the sun had since gone behind a cloud and the butterflies had found shelter out of site. However, we still learned about some of the native plants on Bald Head such as Beautyberry and Wild Grape. We caught the 3:30 ferry back to the island (a ride filled with goofy staring contests between the young naturalists) and uneventful return trip to Raleigh. Thanks so much to Maureen De Wire, and leaders Ed Corey and Nathan and Greg Swick for their help in making this such a great day.